We survived our first medical adventure today. I’ve been seeing a hematologist since January for a plummeting platelet count. I’ve gone through countless blood tests and labs as he has searched for the cause. He’s pretty sure I have a certain blood disorder and in order to confirm this, he scheduled a bone marrow biopsy. “Biopsy” is a scary word and we’ve worked hard to keep it from being scary in our house. This whole thing is to confirm a very non-scary diagnosis. Yes, it could result in a new finding, but that would be EXTREMELY rare. Results on the scary stuff are almost immediate and other tests that involve cultures being grown will take 7-10 days to get back. Today was the biopsy (don’t shudder– remember, NOT scary). We woke up early this morning and drove down to St. David’s South Austin. Brian refrained from making coffee and ate in solitude trying to avoid causing temptation or jealousy on my part. On the drive down, B put on Austin Stone’s new worship album and we sang along as we drove through the darkness. He stayed by my side through it all– registration, application of the rather attractive gown and rubber soled socks (see below), IV, medical history, and procedure explanations. Finally, my platelet level was deemed okay for the procedure and it was time to go. Having not been a patient in a hospital since birth, being wheeled in a hospital bed was a strange experience. Brian and Jimmie, my CT Tech, talked about The Beatles as Nurse Natalie guided the bed to the procedure room. After entering the room and explaining the machines and layout to us, Brian kissed me goodbye and went back to the Short Stay waiting area. The set-up took a long time. I was eager for the sedative, but had to wait. 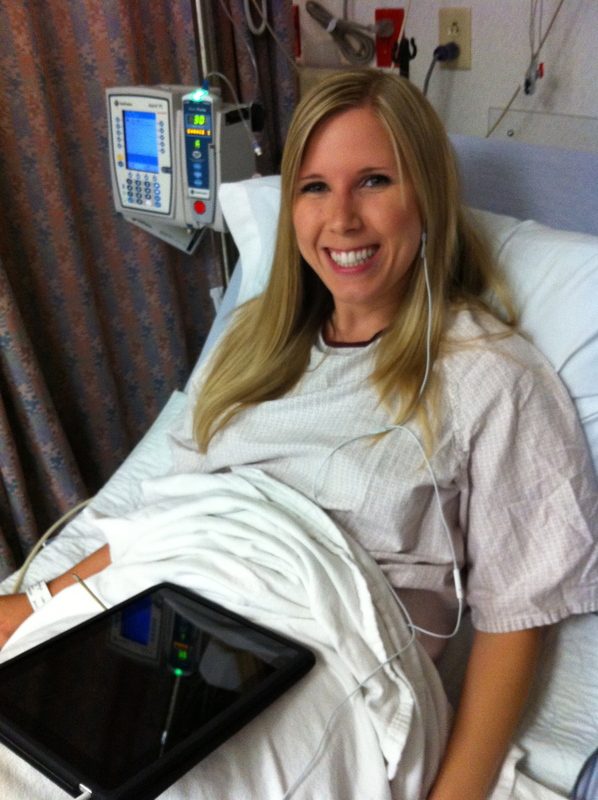 I was hooked up to several machines with tubes and lines and sensors everywhere. The staff was wonderful and so very friendly. They kept checking on me and chatting me up to keep me calm. Finally, the doctor arrived. Nine minutes later, it was over. Really. I remember thinking “oh, the sedative must be working” and then feeling some sharp stings and a great deal of pressure on my lower back, but I wasn’t even cognizant enough to vocalize on the pain. Then, they wheeled me back to my Brian. Brian was all smiles. He was standing beside the breakfast he had ordered for me– fruit and yogurt, and bacon– he loves me! I had to hang out for another hour to be observed post-sedation and to make sure I was fine. Brian and I chatted and joked. And then true to its name, four hours after I was admitted into Short Stay, I was discharged. I’m feeling okay– taking Vicodin and moving slowly. The extraction site hurts and will bleed if I move around too much. I should be fine by tomorrow, with minimal pain. Today should not have been fun, but it was. I know that sounds crazy, but besides the pain– it was a great day. I have this strong, confident man beside me through the scary stuff, a sweet, caring man to be there through the painful stuff, and a devout leader to walk beside me for life. I am blessed beyond measure. This entry was posted in Health, Our First Year and tagged medical by Lindsey. Bookmark the permalink. Wow guys, so encouraging… was such a pleasure to shoot the wedding with Chris!